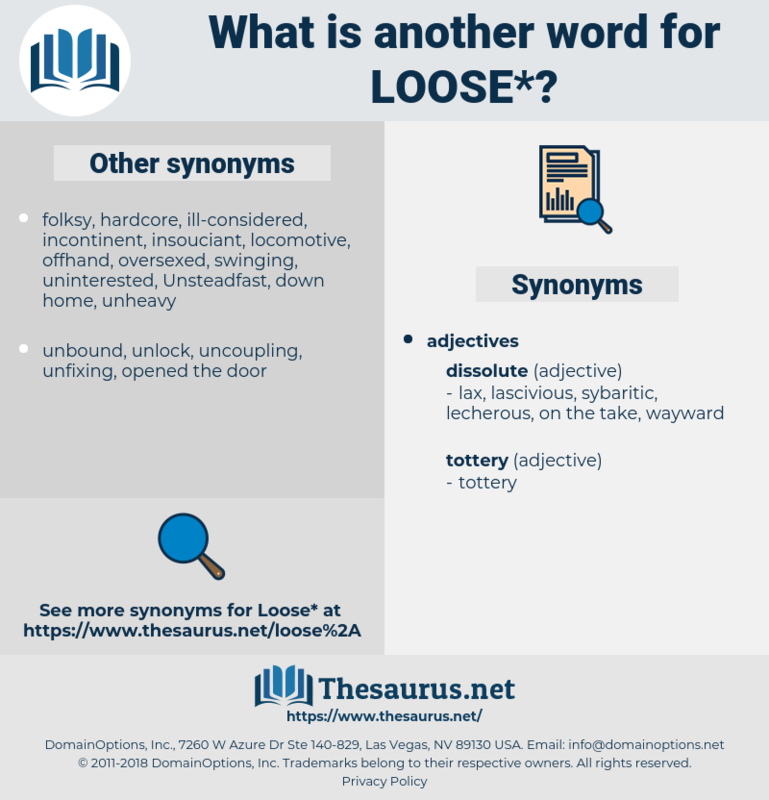 What is another word for loose? 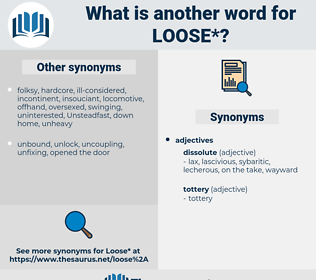 become loose or looser or less tight; " The noose loosened"; " the rope relaxed"
relaxed, slack, cowardly, unconsolidated, lose, vague, feeble, losing, lost, cool, Seconded, weak, free-ranging, imprecise, spineless, scattered, comfortable, sparse, latitudinarian, bulk, easy, permissive, liberal, sluggish, discrete, personal, expansive. loosen, lose, lost, IOSE, waste. constrained, rigid, united, clean, joined, combined, moral, precise, Hindered, decent, attached, restricted, taut, sane, hard, definite, connected, stiff, strict. confirmed, absolute, bound, correct, controlled, validated, painstaking, determined, dead-on, good, careful, heavy, honest, sticky, certain, supported, official, meticulous, kidnapped, errorless, Immured, consolidated, restrained, responsible, unquestionable, uncorrupted, gummy, clayey, indisputable, undeniable, substantiated, penned, Anchored, factual, indubitable, dead, clenched, principled, tied, constipated, defined, scrupulous, coherent, gelatinous, confined, incorruptible, incontestable, decisive, choky, clinched, bolted, valid, fine, implacable, compressed, established, irrefutable, stern, unqualified, fastened, shackled, gluey, glutinous, virtuous, close-packed, cloggy, tight-fitting, skinny, positive, clear-cut, incontrovertible, enclosed, punctilious, sure, pure, harsh, tightly fitting, conscientious, imprisoned, sound, corroborated, definable, Uncorrupt, fettered, close-fitting, severe, gooey, chained. For you have let loose a violence where you are weak and we are strong. Robert of Herepol had meant to leave his prisoner loose. lawless, loggia, laze, lasso, leech, leo xiii, lough, Louis I, liza, Leo Esaki, leaky, legacy, laugh, luxe, luge, legs, loach, lx, lexis, laicize, lek, leach, lass, leek, Lake Cayuga, lac, louse, lag, lewisia, lachaise, likewise, look, lhasa, leacock, lxx, less, loligo, lock, lac wax, lilylike, leo ix, lxxx, lascaux, leash, Leo X, lilac, lycee, louis, lichi, Lego, lockage, laic, lxxi, logo, loki, Louis Xiii, laws, luce, lassie, Louis Agassiz, Louis Iii, lash, logos, log, lewis, lessee, Lugh, like, logy, log z's, lao-zi, Louis Xii, loloish, laicise, luggage, Louis X, lucas, leggy, lisu, lachesis, lees, locke, Lech, losses, lxxiii, lakh, loasaceae, lazy, leg, Louis Ix, liaise, Louis XI, lxi, locus, lollygag, lugosi, lxxxii, leigh, lxiii, loess, leakey, lox, laugh away, lagos, llullaillaco, lycia, look away, lygus, lake keuka, lace, loxia, lxii, loss, lycosa, lucky, lose, loquacious, loge, leak, lousy, loco, luik, liliaceous, lease, lake, laius, lacy, luke, lochia, loch, leuciscus, Lusaka, lush, luck, lax, liliales, luscious, lxxxiii, lxxxi, lazio, lyssa, leechee, lug, lxxii, lysis, lux, lichee, lallygag, lucy, logic, lie awake, lack, league, lackey, leakage, Liliaceae, low-key, lockjaw, lechwe, loos, lick, laos, lassa, louche, lasix, lossy, lock away, Louis Ii, loasa, lychee, liege.